With an emphasis on safety and adult supervision, Forest Craft presents a range of simple and fun whittling projects that children can make and enjoy hours of play with afterwards. 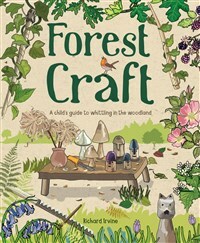 The author, Richard Irvine, extols the virtues of exploring woodlands, getting to know the trees in your local area and learning about their characteristics and suitability for whittling. Projects include kazoo, mini furniture, duck call, rhythm sticks and elder wand. Includes a thorough guide to the basic tools and equipment that are required, the timber he recommends and would advise against for beginners, and the techniques that will be used in the projects. 20 whittling projects, with simple step-by-step instructions accompanied by photographs and useful tips. Includes a chapter on safety and safety tips throughout. Appealing to both forest school teachers and families, this is a book that can be turned to time and time again, through the different seasons and over many years. The skills learned can be treasured and passed down through generations, in time-honored traditions. Richard Irvine is a passionate advocate of high-quality outdoor-learning experiences for children and adults. He is a qualified teacher and greenwood carver. Irvine lives in Torrington, Devon, UK.